One of the things I envy about the people of Davao is their accessibility to one of the best islands in the Philippines – Samal Island. It is just less than 30 minutes away from the best beaches! I’ve been to several resorts in Samal and while most of it are really beautiful places, Chemas by the Sea is actually a must-visit one (and in fact, only less than 15 minutes away from Davao). I’ll tell you why! My vlog about Chemas by the Sea is also up. You can watch it here to know our experience! The resort is not crowded. Unlike some of the most popular resorts in Samal like Paradise Island, Sunset beach, Cavanico, etc., Chemas is, by far, a peaceful place by not being too crowded. I learned after my visit that they don’t allow walk-in guests. Instead, a reservation must be made prior. That is how they manage to control the number of visitors per day. We went there for a day tour package last Sunday and we were able to enjoy the beach and their salt water pool since only few are booked that day. The area isn’t too hot. Thanks to huge trees, they kept the visitors away from direct heat of the sun. This also makes their salt water pool a great place to stay longer. Plus, malamig ang tubig since wala masyadong init. By that, this is perfect for those takot mangitim and magka-sun burn hehe. I personally like it too since most of the beaches, they only have umbrella or cottages to protect you from the sun. The beach and the water are both stunning. Although Samal Island is one of the best, there are resorts that are not as stunning as others. In fact, there are resorts that do not have shoreline like Maxima. Chemas is a good combination of white sand beach and a clear, pristine water. It’s friendly to kids during low tide. It is also instagram-worthy place for those who loves taking photo of themselves with the beach. To be fair, I’d like to share a little thing I don’t like about the resort. (1) The reservation staff is quite disappointing. Although we were able to reserve our vacation, there wasn’t really a confirmation that it was indeed reserved. I just assumed that it was reserved as implied in the replies. Ram’s friend also had the same experience when they had their reservation. (2) The food they serve is not worth the price. They serve small and not as good as we thought. Knowing that they have that exclusivity of the foods for guests, I thought they can do better since most, if not all, of the guests will have a taste of what the restaurant has to offer, unless they’ll skip breakfast, lunch or dinner. (3) With all the restaurant I have tried, theirs is the first time I experienced a restaurant not offering service water. But other than that, there’s nothing I can say worse about Chemas. My great experience still outweighs the negative ones. I would still recommend it to my friends and to you. For me, it is still one of the bests of Samal Island! Just visit their Facebook Page at Chemas by the Sea and place your inquiries or you can also message them at 0917-814-0814. *We allow max of 2 pax excess per Cottage/Cabana @ P800/person beddings on the Floor, except for cabana 1. *Strictly No Food, Drinks & Water allowed. *Breakfast not included in all cottages/cabanas. Umbrella Hut is P500 good for 7 person, more than 7 plus P50/person more than 10 you have to get another Hut ( divisible by 7 ). *Day Tour starts at 7am till 4:30pm. *2 year old & above same rate as adult. *No Food,Drinks & Water allowed. *Proper Swimming Attire is required. *We allow bringing of chips or cake. Just ride a jeepney or taxi going to Waterfront Hotel, Davao. Just tell the guards that you are going to Chemas. You’ll go inside the hotel vicinity to get to the boat. You can ask the staff of directions where to go. But please take note that you need to have reservation first prior so they can accommodate you. BOOK NOW to Chemas for SOME DISCOUNTS! Just click the photo below. 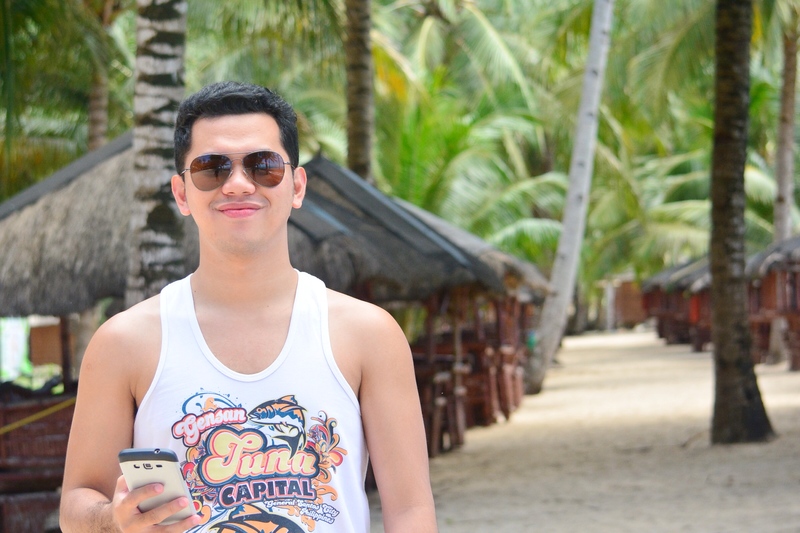 One of the best ways to spend your time while in Davao is to have yourself experience the beautiful beaches of Samal. The Island Garden City of Samal (IGaCoS) is only 15 minutes away from Davao City Wharf (Sasa Wharf). There are a lot of beaches you can choose from that for sure are worth it more than any other beaches in Luzon. Last May 28, we decided to have an island hopping in Talicud Island. This is the island at the back of Samal, thus, where the name came from. According to some locals supported by online reviews, Talicud Island is way better than Samal. The sand is pure and white. The water is clearer. The accommodation is much cheaper and the species are more diverse. The island hopping only takes less than a day. We contacted a reservation for small boat good for five for only PHP3,500.00 via Kuya Ronnie (09985762967). It’s highly recommended, especially during peak seasons (summer), to have boat reservation before anything else so you avoid long queues in the Sta. Ana Wharf. Kuya Ronnie is a diver and the crew are very polite and funny so you’ll really have a good time spending the day at this island. We left Sta. Ana Wharf at 8AM and reached our first stop few minutes before nine. Since Talicud Island is located at the back of Samal, it takes longer to reach the island than in mainland Samal. Our first stop was the 25-kilometer-stretch of corals called the Coral Garden. Be ready to be blown away by the diverse life it carries. You’ll better have a good picture of it when you go diving. According to Kuya Ronnie, fee for diving is 800pesos including all the gears. Apologies if I don’t have a picture of what I’m saying. I don’t have action camera yet so what I can only show you is the place where we stopped. If you join other groups in island hopping, the crew will only allow you to stay in each stop for about 30 minutes. However, for reservations like we did, you can decide whether you want to stay longer in one place or not. We stayed for more than an hour in this place. You better bring your own goggles so you avoid renting for 50 bucks every stop. At lunch time, we stayed at Babu Santa beach resort. This is where everyone go for lunch. They have a docking fee of PHP250.00 but a cottage is already provided. If you have no baon, you can buy foods from them only that it’s sort of expensive hehe. Although we bring in food, we still opt to order some such as a kilo of rice, tinolang manok, two liters of soft drinks, six buko juice and we paid for around PHP1,200.00 including the docking fee. Ganyan siya kamahal. But on the other note, this place is a paradise (less the guests hehe). At peak season especially summer, there are a lot of tourist plunging into this place. I went to Babu Santa 2 years ago at around November, we were the only visitors. Kaya I called it a paradise kasi you’ll feel the serenity of the place with only the sound of the wind and the waves that’s music to the ear. Below are the other photos that for sure will entice you to have a dose of Vitamin Sea. At 3PM, we’re done exploring this side of Samal. We need to go also since the waves are getting stronger as the sun comes down. It’s a worth it experience when you’re in Davao. Nakakabilib how rich we are in natural resources and to have places such as this, it’s something we should be thankful for to witness it’s beauty. If you have inquiries, you may comment below. Thank you for dropping by! PS: Photos are not edited. Those were captured using Nikon DSLR.